Looking for Spain Beach Resorts for your next vacation? Spain is bathed in sunshine and while there are variations in temperature, you can expect to find some outstanding weather. There are some great beaches in Spain, especially if you want to stay on an island. 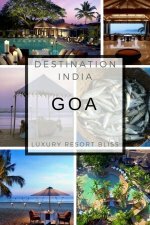 Below are some the best beaches with the best resort to stay at there. While the Canary Islands archipelago are in the Atlantic Ocean, they are such a long way south to within 100 km of the coast of Africa to ensure a yearlong warm climate and ridiculous amounts of sunshine like nearby Morocco. The volcanic string of islands consists of 7 major islands. Hundreds of Kilometres of coastlines and beaches are home to some of Europe's most spectacular and diverse range of resorts. 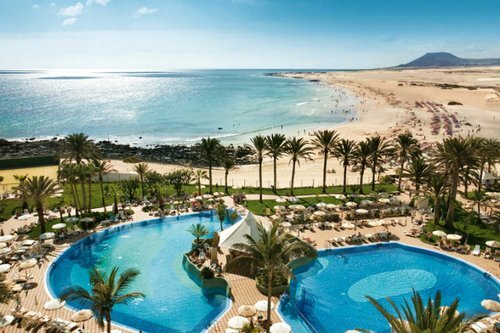 The best beach resorts in the Canary Islands are admired for their famously sunny climate in a unique setting. Gran Canaria alone has 21 different but outstanding locations in itself! One of the more popular beach locations in the Canary Islands is Tenerife. 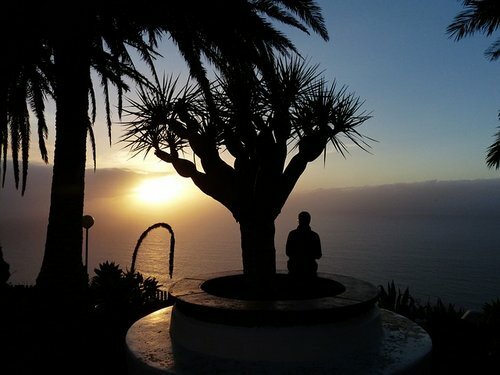 There are a number of great resorts here, to see the best, visit: best all inclusive resorts in Tenerife. 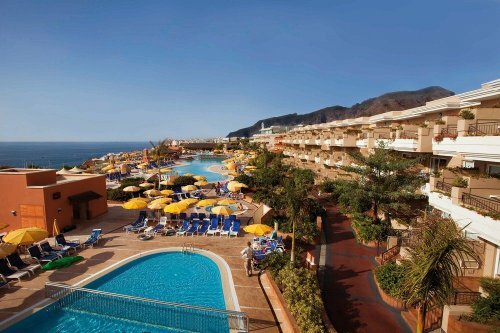 A great all inclusive resort in Tenerife. Less than an hours flight from Barcelona, between France and Africa of the Catalonia coast in Eastern Spain, lies the pretty Balearic Islands. There are a number of famous islands and vacation spots, including the party going Ibiza, and the much more laid back Minorca. The larger city of Palma de Majorca also draws crowds of apartments and is somewhat citified. Otherwise enjoy some of the warmers vacation conditions in Spain outside of the Canary islands, and some stunning clear waters, beaches, and natural settings. With some more affordable holiday options available, it is easy to think of Ibiza as only a party island but there is more to it than that. THere are the buzzing nightclubs, but also a surprising number of classier and affordable all inclusive, and luxury resorts. Located at Playa D'en Bossa in Ibiza, this is a 5 star luxury resort with excellent reviews from past guests. It has around 400 rooms, 4 restaurants, a full-service spa, pools, rooftop terrace, 7 tennis courts, garden and more! 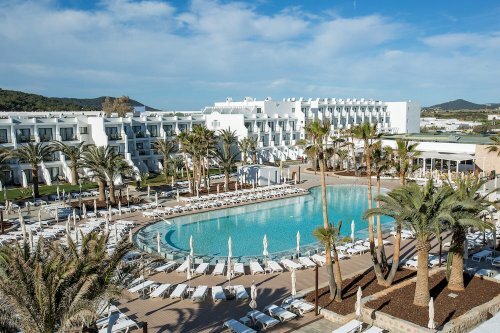 Get more information and see the latest reviews for Grand Palladium Palace Ibiza Resort. Everybody loves a new resort. Especially when it is situated right on Playa d’en Bossa in Ibiza, like the wonderful new Grand Palladium White Island. This largish 430 room vacation resort has all you could expect of a modern all inclusive including professional entertainment, kids and teens club. 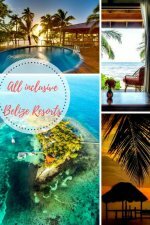 All inclusive beach resort with a children's club, full-service spa, close to the beach, pool, 4 restaurants including a buffet, and excellent reviews from past guests. See more information and see the latest reviews for Grand Palladium White Island Resort. 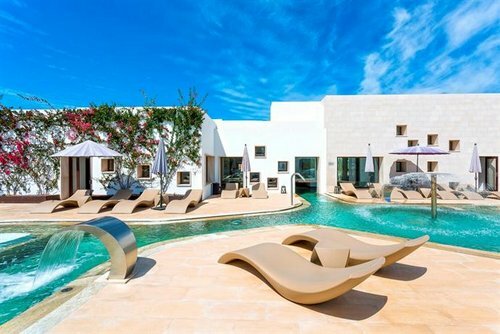 For more in Ibiza, see the Top 25 Resort Ibiza, Balearic Islands, Deals with Reviews. Majorca is not only a beautiful place to enjoy the Spanish coastline, it is also rich in history and attractions. Majorca is known for it's many beaches. That's why it managed to get two beaches into the TA best beach in Europe list. These are perhaps among the top in Spain and a great place to enjoy a Spain beach resort in luxury. Jumeirah Port Soller Hotel sits on the cliffs above the fishing village of Port Soller Mallorca and is the ideal place to soak up the sun and al fresco restaurants and bars specialising in traditional Spanish offerings. This is our top small resort with only about 100 rooms a gym, swimming pools. The attraction here is the luxury factor from the pool areas, the spa through to the modern spacious rooms. Best of all this resort offers great separate areas ideal for kids kids and adults. This resort is family friendly and has a children's club in addition to the pools restaurants, tennis courts and more. Like many of the Hotel Globales hotels, the Sumba has a rate that is either for the room only or for all-] inclusive. All inclusive include food and beverages in the room rate. Click above to read more about this all inclusive resort that is perfect for families. See more great Majorca resorts on our Spain All Inclusive Resorts page. The Costa Del Sol is the perhaps one of the most touristed and most famous regions in Southern Spain. The area is roughly the coastline between Malaga and Gibraltar on the southern tip of Spain. This part of Spain sits against the warmer waters of the Mediterranean offer a significantly warmer climate to the Atlantic beach resorts. While the warmer year round temperatures and sandy beaches have meant too much development, hoards of tourists, and everlasting parties there are some quality resorts options that are stylish and offer sanctuary. Málaga, Torremolinos, and Nerja are popular destinations. The whole of the Andalusian coastline is often warm, sunny and sandy like this. Costa Blanca further north is also sunny with white sands and clear seas in the dry summers. Benidorm and Alicante are popular. The best Costa del Sol resorts. 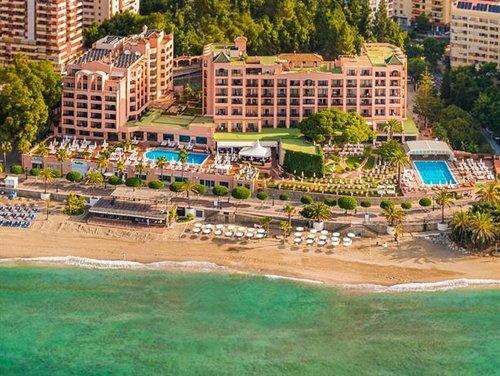 Gran Melia Don Pepe is our top luxury resort in Costa del Sol. 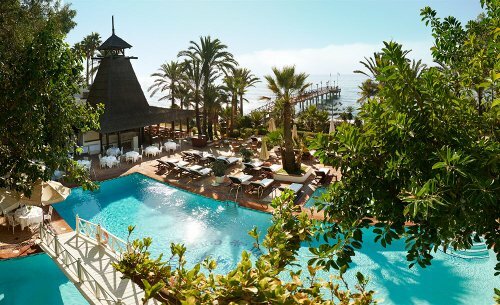 The resort is ideal if you have kids or on honeymoon alike, and only minutes from the old town in Marbella. This is quite upscale to the extreme of butlers and really personalised service but also has all the facilities you need for a great vacation. Pool areas vary from kid friendly to areas that are quiet for the honeymooners and romantics, as well as the spa. A relaxed beach club contrasts with the luxury surrounds of the resort. Reviews are outstanding. We consider the beaches near Costa del Sol including Marbella, Torremolinos and Malaga nice but a little crowded. If you enjoy a lively atmosphere, this may be a great spot for you. Is possibly one of the best overall beach resort hotels in all of Spain as far as service and quality go. This resort is well regarded by those who stay there and well worth a visit. Good spacious apartments. With over 700 beaches, the green part of Spain does have enough of the crystal clear water options to satisfy the discerning beach critic. Check out this video which provides information on the beaches and attractions of the region. Costa Verde in contrast to the Mediterranean areas are greener and the summer temperatures are moderated by the Atlantics cooler waters. Santander and Gijón have the best beach resorts. The beaches of Galicia Spain top our list for the best beach in Spain. Lots of places with unspoilt and quiet beach resorts. For more beach resorts, see our Spain All Inclusive Resorts page. The rockier Costa Brava is the area of small beaches from Barcelona to France. The Salvador Dalí coast here is full of little nooks which make ideal locations to hide charming little hotels and mini resorts. Looking for a great small hotel Spain option or boutique hotel? We have found hundreds of the best small Spanish hotels from all locations around Spain. 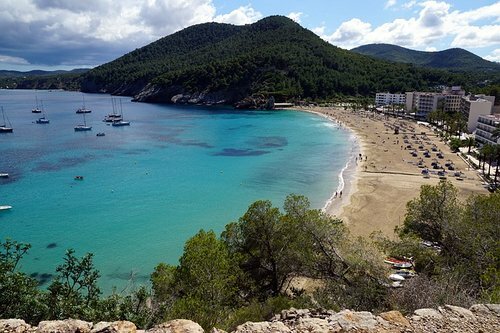 Salles Hotel & Spa Cala del Pi is terrific for a honeymoon overlooking the sparkling clear waters of the small cove to explore for evening walks or days soaking up the warm Mediterranean waters. The facilities of the small 50 room resort especially the whirlpools, full spa, and waterfall pools. 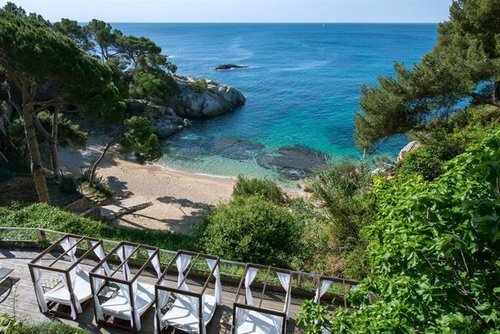 Soak up the luxury, explore Platja d'Aro, or day trip Barcelona if you like. An excellent choice with outstanding reviews. More reviews and special offers on the Salles Hotel & Spa and others nearby. A classic Catalan building and built in 1932, this resort features terracotta tiles and green window shutters. 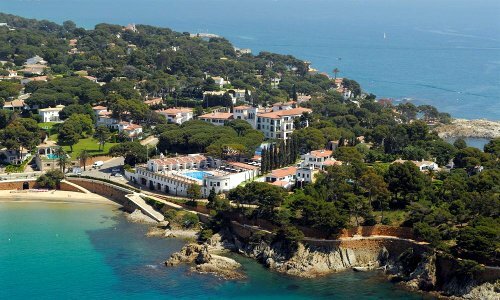 It's located on the S'Agaro seafront, 30 km from Girona, Spain. Barcelona airport is about an hour away. Amenities include an outdoor pool with private cabanas, health and beauty treatments, a concierge, a seaside path for quiet walks and a fitness room. The resort is in a great location to explore the surrounding area also. There are several dining options from formal to sandwiches and appetizers. The 73 guestrooms have marble and wooden floors, luxurious fabrics and carved ebony furnishings. All have AC, wireless internet and cozy bathrobes. Reviewers say it's a charming place and the staff are excellent. The location and the coastal paths are beautiful. Some say it needs updating and it's not quite up to it's 5 star rating. Self catering apartments Torviscas - Torviscas is in the Costa Adeje area of Tenerife and boasts a really nice golden sandy beach along with beach bar and water sports.